Audience members will participate in the selection process for the “Best of the Fest” dance film maker. FREE! 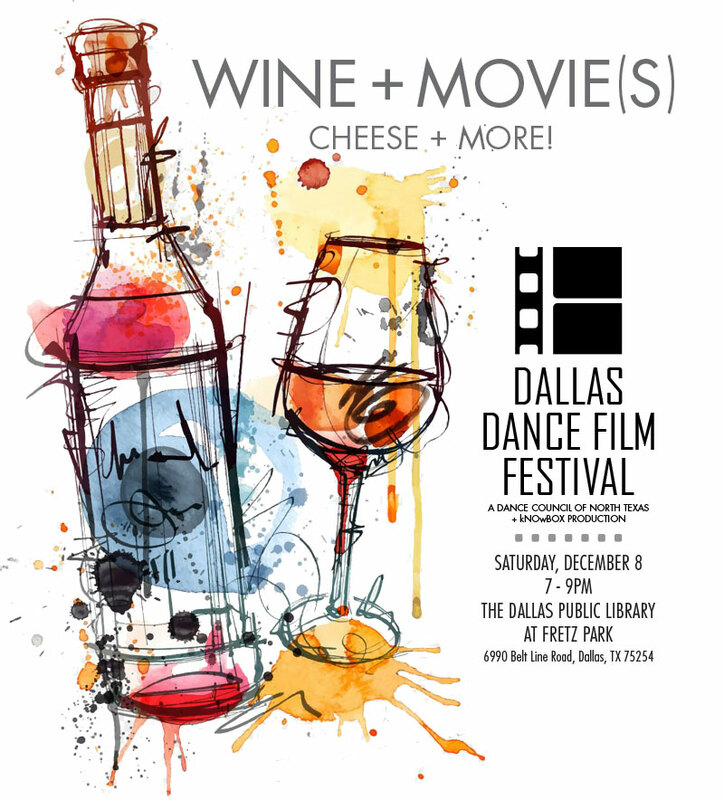 Dance Council of North Texas (DCNT) partners with kNOwBOX dance and the Dallas Public Library to host the inaugural Dallas Dance Film Festival (DDFF) at Fretz Park! and professional dance filmmakers and to provide an affordable platform for them to share their work. The festival also offers the community at large a new way to observe and experience dance. Join us as we begin this journey into a new phase of dance in north Texas! Synopsis: NIVETTE is a musical participation with the redundancy of refrains to note the monotony of the daily life of it, persuaded to have the disease of old age. Bio: Gaetan Boschini began his training in various styles while in Bordeaux, France with the company « TILT EVO » and the group « ART NEGRA ». After discovering the artistic techniques of choreographers Olga COBOS and Peter MIKA, he decided to finish his training with CobosMika SEED's in Spain, where he joined the Junior Company. This year allowed him to reinforce his artistic vocabulary by working alongside renown choreographers such as Anton LACHKY (Les Slovaques), Laly AYGUADE (Akram KHAN), Samuel LEFEVRE (PEEPING) and Maëva BERTHELOT (Hofesh SHECHTER). In addition to Cobosmika SEED's, he worked with the company « La Licorne » directed by Alain GRUTTADAURIA with which he performed in the duet « Les extravagances extraordinaires d'un extraterrestre », still currently touring. He joined CobosMika Company for their last creation « NWNM » and the company of Mélodie Cecchini for « On dirait qu'on serait ». He has showcased his work in France, Germany, Spain and China by being a guest teacher in various festivals, dance schools and training schools. He is also a regular teacher for CobosMika SEED's. Synopsis: Secondary Surfaces Redux presents meditations on the durational aspect of time and the human relationship to labor and survival as two women arduously traverse an expanse of white paper armed only with black charcoal and their bodies. Bio: Roma Flowers, a theatrical lighting, projection and video designer has designed for theatre and dance. A recipient of the prestigious New York Dance and Performance Award (a.k.a. Bessie), Roma has designed for such various performing artists as Jordan Fuchs Dance, Dark Circles Contemporary Dance, The Dance Theatre of Harlem, Hope Stone, Inc., among others. Dr. Nina Martin, professional dancer, choreographer and master teacher, was a founding member of Channel Z (NYC), New York Dance Intensive and Lower Left Performance Collective. Roma and Nina are both currently on faculty at Texas Christian University’s School for Classical & Contemporary Dance in Fort Worth, Texas. Synopsis: The figure of the indigenous and the conqueror are reunited in an island of the future to change history through the recognition of the other and the value of joint creation. Bio: Barcelona hold a degree in Audiovisual Communication from the Autonomous University of Barcelona. It is linked to the image and its surroundings with projects related to the processes. He has always liked the documentary genre and video dance, and he feels comfortable working in both genres. Synopsis: Two girls have created a world beyond time and space, dancing through the eery halls of an abandoned monastery. Bio: Jeppe Lange is a filmmaker studying at The Royal Danish Academy of Fine Arts.His work covers the field between documentary and experimental film; reality seen through a conceptual lens. During the last four years he’s had several films on festivals in Denmark, USA, Germany, Italy, Croatia etc. Jeppe Lange was born 1987. He lives and works in Copenhagen. Synopsis: A short dance film that explores notions of identity where the search to belong unites you as one. “We are Here" is a pioneering new dance film that connects and contrasts two contemporary forms of ballet performed by Freefall Dance Company and Birmingham Royal Ballet principal dancers. Bio: Sima Gonsai is a visual artist and filmmaker, based in the West Midlands. For the past 12 years her practice has specialised in screen based work. She became established in 2004 with the launch of “Cycle Dialogues”, a four year touring visual arts project, documenting and connecting multi-cultural communities through experimental film, video installation and published writings. Originally trained in Bharatanatyam dance, her career began as an amateur performer where she later studied a Masters in "Screen Dance’. Currently, she is developing her practice as a screen dance director. Since 2011, She has independently produced and directed a series of screen dance films in collaboration with Freefall Dance Company and Birmingham Royal Ballet. Her recent success has launched her as a director both raising the profile of British screen dance as well as promoting dancers with severe learning disabilities. As part of this work, She has attended several festivals, gaining a wide network of curators, producers, screen directors, choreographers and dancers. Most recently, her screen dance films have been screend at San Francisco dance film festival, Loikka, Oklahoma, Sweden, Romania and Flatlands dance festival. Synopsis: A poetic interplay of three simultaneous visual perspectives of one soloist, Three suggests the complexity, density, and richness of experience at the core of dancing and utilizes disorientation as a strategy for making the embodied experience of dancing accessible through video. Melissa Sanderson is a Seattle-based dance artist whose dance films have been shown by festivals in U.S.A., Italy, Turkey, Brazil, Mexico, Taiwan, Canada,and France. Melissa has worked with Jordan Fuchs Company, Coriolis Dance/Christin Call, The Gray/Beth Terwilleger, and General Magic/Jessica Jobaris. She holds a M.F.A. in Dance (2014) from Texas Woman’s University and teaches as Adjunct Faculty at Bellevue College, Eastfield College, and Tarrant County College. Synopsis: What if reality went whimsical on us - could we still waddle together, even without really seeing? Bio: At present an Independent Dance Artist, Jiexiao teaches swimming for a living, whilst creating video works, whether weddings, commercial or artistic, through his company Rice Bowl Pixels. He is primarily concerned with topics relating to the human condition, of late particularly notions of loneliness. Synopsis: Do you ever wish you could shut off all the voices in your head? Who are you when the voices go silent, even if just for a moment? Bio: Holly Wilder is a choreographer, performer, and filmmaker based in NYC, and Artistic Director of award winning dance film company, Wilder Project. She holds a BFA in Contemporary Dance from The Boston Conservatory. Her choreography has been presented at the Battery Dance Festival, the Institute of Contemporary Art in Boston, the Museum of Fine Arts Boston, INSITU Site Specific Dance Festival, and in multiple music videos. Her dance films have screened at film festivals all over the USA and Canada, and her film “The Field” received First Place at Verve Dance Film Festival in Utah. She is also on the jury of the LA Dance Film Festival. Bio: Tomer Zirkilevich is an Israeli Choreographer, director, performer and teacher, based in Berlin. Graduate of The School of Dance Arts of Kibbutzim College, Tel-Aviv; Studied theatre, dance and composition at Studio Play and at the preparatory course at the Nisan Native Drama Studio.Choreographer of the Pieces: “Psyche and Amor”; “My David”; “Infidelity: A love story”; “Auf Wiedersehn”; "Like Father Likes Son (part 2), "LOVERS1"; “Tigers” and more; Received a study scholarship from the Caesarea Fund for outstanding dance-theatre students. Was awarded the Oded Kotler Prize for young artists in Ashdod. Synopsis: Veer is a poetic dance short film about ruling and being ruled. Bio: Mariama is a director and professional dancer from Norway. She experiments with movement, space and moving images in collaboration with architect and filmmaker Sveinung Gjessing. Bio: Born on 1967. His work develops through the use of a wide variety of media, among which video, photography, installations, writing, and performances. His videos have been selected for important international festivals and have been screened at the Saitama Arts Theater in 2015; the Perez Art Museum Miami, 2016; the Lincoln Center for the Performing Arts in New York, 2016; the ZKM in Karlsruhe, 2017; the Nevada Museum of Art, 2017 and the Whitechapel Gallery, London, 2017. In 2009 he was awarded the Terna Prize for contemporary art. Synopsis: A man in white-winged angel shoes awakes in infinite black to the strains of Liszt’s “Dance of the Dead”. Bio: Richard James Allen and Karen Pearlman are the directors of the critically acclaimed Physical TV Company (www.physicaltv.com.au), based in Sydney, Australia, where they create award-winning dancefilms, dramas, and documentaries. Their work has screened at hundreds of film festivals around the world, including most of the leading dance film festivals, been broadcast on television and collected by major international film archives. cohesiveness and clarity of artistic intention, quality of choreography, performance, cinematography, and editing in relationship to the stated artistic intent. Artists are responsible for holding copyright permission for any elements used in the film that require permission such as music, text, images. The following resource may be of assistance for information on music copyright: opensourcemusic.com.